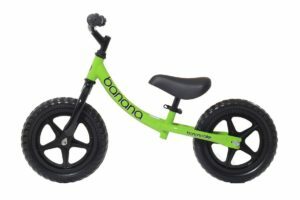 Banana balance bikes are among our favourite models for 2019, as they combine a really competitive price with a fantastic design and a range of superb features. 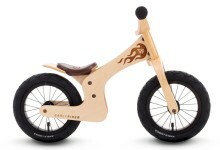 There are 2 different models available of the Banana balance bike, and the first of these is the LT model. The signature feature of this bike, that both models share, is that is the frame is curved like a banana. This has the dual benefits of allowing the child to easily access the bike – and it also looks really cool! 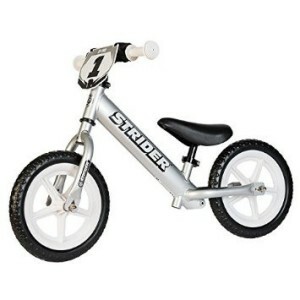 This bike is lightweight and strong, and with a saddle that is adjustable from 31cm to 40cm it is suitable for children aged between 2 and 4. We think it will be an ideal gift for a 2nd or 3rd birthday! 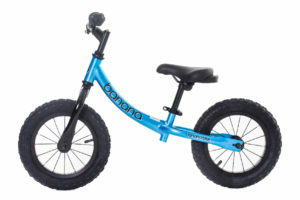 The Banana balance bike has been improved for 2019, and one of the upgraded features is the twin bearing headset. 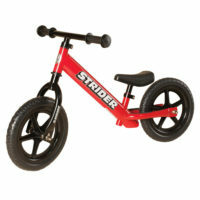 This provides a smooth steering action and is both lightweight, strong and durable. The wheels have also been updated, with a grippier tread pattern which helps in wet conditions and a revised spindle and bearing set up which allows for better free spinning of the wheels. Another fantastic feature of the Banana balance bike is the handlebars, which are wide enough to help with steering and include safety features with updated rubber grips. The handlebars can also easily be adjusted using the clamp. 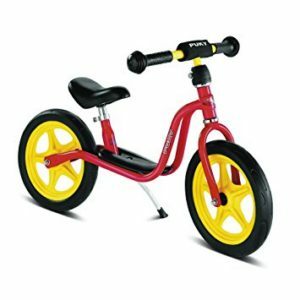 There is little to fault the Banana balance bike, as it includes a great range of features, the ergonomic design will help children to learn and it is available for just £37.99. Colours available include blue, pink and green (pictured). The GT model includes all of the benefits of the LT model, but with a range of improved features that give it a slick and premium look. The GT model features 12” alloy wheels, so this really improves the appearance of the bike and air filled tyres provide a comfortable ride and greater traction. 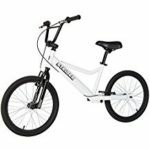 The aluminium handlebars are lightweight and strong, and combined with the threadless headset provide a steering and handlebar set up that is often only found on adult bikes. 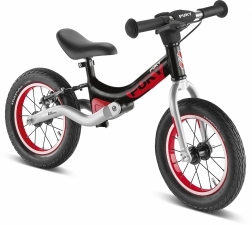 The saddle height on this bike ranges from 32cm – 40cm, so this is a similar range to the LT model and makes it suitable for 2 year olds and upwards. However, it is slightly heavier than the LT model (3.6kg v 2.9kg), so if it is a younger child you are buying for we would recommend the LT model. 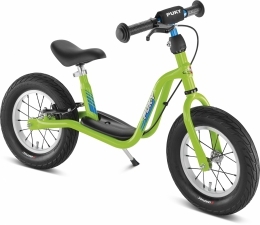 The Banana balance bike GT model is slightly more expensive at £47.99, but if you are looking for a cool, cruising bike for your child to begin their journey on two wheels this makes a fantastic choice! 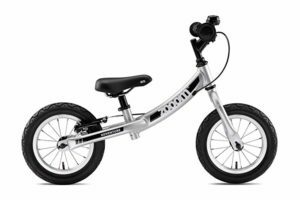 Chillafish balance bikes cater for all ages with bikes ranging from the Bunzi balance bike for very small children through to the Jack & Josie and BMXIE for a cool and stylish off road ride. 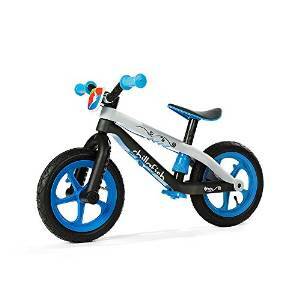 The Chillafish BMXie-RS balance bike has a cool and stylish BMX design, so it looks great and also performs very well with a range of quality features. This bike is great to use on more uneven surfaces like the park or rough trails, as it now includes Airless Rubberskin tyres for excellent grip and performance. These tyres includes a foam core so they do not puncture, but an outside rubber layer gives them the appearance of real tyres. This provides a great combination of good grip with no need to pump the tyre up. Kids will also love the number plates as well as the sticker set for customisation. 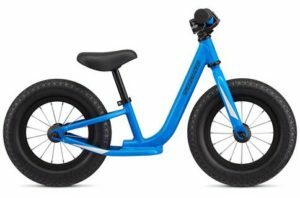 The seat is adjustable, which is the case with most balance bikes and with a seat height ranging from 32 – 39cm it will be suitable for most 2 to 5 year olds. 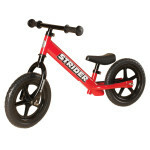 You may find that 32cm is a little high for most 2 year olds, so consider a Strider or Puky bike as an alternative which start at 29cm. 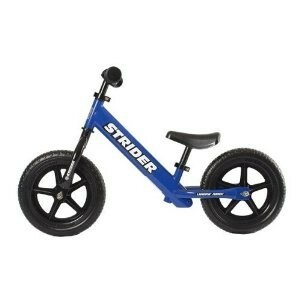 You can check out our recommended balance bikes for 2 year olds in our guide. 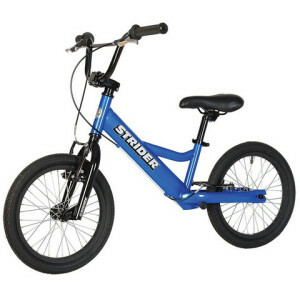 We think this bike is ideal for 3 year olds, with the perfect saddle height, a great value price and some excellent features that should see your child all the way through to a pedal bike. 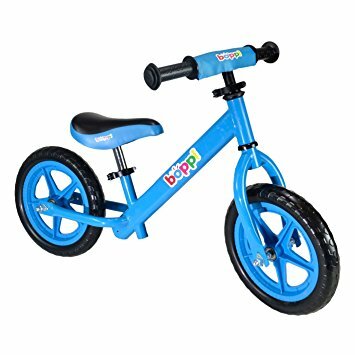 Other recommended balance bikes for 3 year olds include the PUKY LR1 Learner Bike, the Strider Classic and the great value range of Boppi balance bikes. 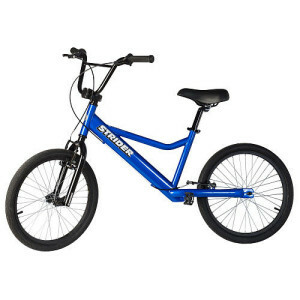 The Chillafish BMXie-RS is perfect for riders who prefer a BMX and off road style with a superb design, high quality specification and it is really fun to ride. It is available in several colours including blue, green, red, pink and yellow and generally available for between £55 and £65. 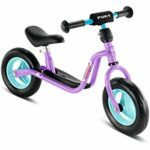 The Bunzi balance bike is an extremely clever design as a unique 2-in-1 balance bike that can be converted from a 3 wheel tricycle into a 2 wheel balance bike without the need for tools. 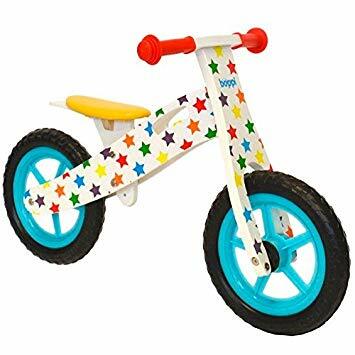 This means that it is suitable for younger children from around 12 months, and the extra stability provided by the 3 wheels means they will soon be racing around the living room and enjoying life on their bike. The seat position is low to the ground on the 3 wheel bike, which makes it easy to ride and an ideal way to learn the principles of steering and using your feet to get along. The Bunzi balance bike can then be converted by removing the seat and changing the bike into balance mode, but if you find your child isn’t quite ready for this yet you can switch between the modes as often as you like. The seat is adjustable on the Bunzi balance bike (from 22cm in 3 wheel mode to 25cm in 3 wheel mode), and this is essential as children grow very quickly at this age! The bike is made from lightweight high quality ABS material which makes it very light, and it is also easy to carry with the seat handgrip. Another clever feature is a hidden storage box in the seat which means that your child can bring along their favourite toy, a snack or a drink for the ride. The Chillafish Bunzi balance bike is a really exciting option which makes cycling a lot of fun for very young children. It is great introduction to balance bikes and the anti-skid, non-marking rubber synthetic tyres means it is ideal for use both in and out of the home. 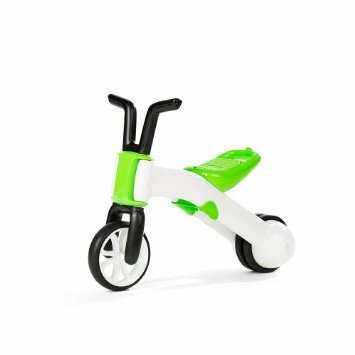 The Chillafish Jack & Josie balance bike is aimed at slightly older children aged 3 and above, and differs from the BMXie with a more retro style. Jack & Josie is available in two very different colours, and you can choose between a bike with black frame and a flame design or white frame with flowers. Both bikes consist of a steel V-tube frame for strength and durability, and a clever feature of the Jack & Josie bikes is the floating footrest for easy balancing while the riders are on the move. 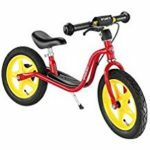 The seat is also adjustable on these bikes, and with the seat height beginning at 36cm it is definitely a bike for older 3 years or above. The maximum saddle height is 43cm. Jack & Josie balance bikes are also equipped with wide handlebars for easier steering control as well as 12 ½ inch inflatable tyres. Jack & Josie bikes are generally available for around £50. All of these beautifully engineered bikes from Chillafish are extremely high quality, so although they may be more slightly expensive than other bikes on the market you will definitely get what you pay for and the bikes should retain a high resale value. 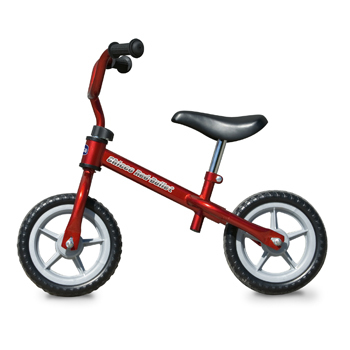 The Chillafish balance bike range caters for all balance bike riders from toddlers just learning to walk to more experienced riders ready to try some tricks on their BMXie or Jack & Josie. Enjoy the ride! The Chicco Pink Arrow Balance bike is manufactured by Chicco and is the sister bike to the Chicco Red Bullet Balance bike, with the same specifications making it an ideal bike for a 2 year old. The Chicco Pink Arrow balance bike is one of the very lightest bikes on the market at just 2.7kg, which makes it an ideal starter bike especially if you are shopping for one of the little girls in the family. 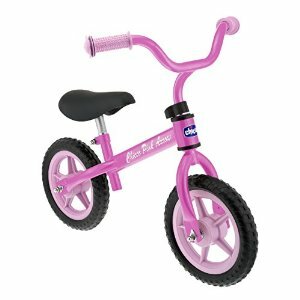 The bike is constructed from a metal frame painted a striking pink colour, and other features include an adjustable seat, safety handlebars and plastic tyres. 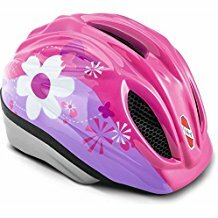 This means that the bike can be used as a toy inside if the weather isn’t great or if your little girl is just starting to learn. A hand brake is not included on the Chicco Pink Arrow Balance bike, but this is not necessarily a problem as younger riders often lack the co-ordination to use a brake and use their feet to stop or slow down instead. 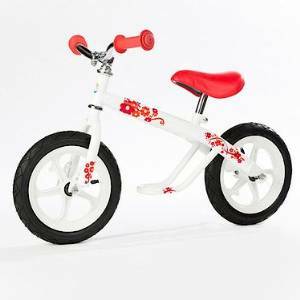 As per our review of the Chicco Red Bullet Balance bike, the thin chassis and light weight nature of this bike make it a great choice for 2 – 3 year olds, although the very short wheel base can sometimes make the bike difficult to handle. 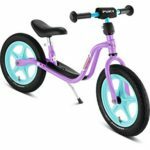 The Chicco Pink Arrow Balance bike is generally available for around £30, which makes it exceptional value and a candidate for one of the best budget balance bikes around. 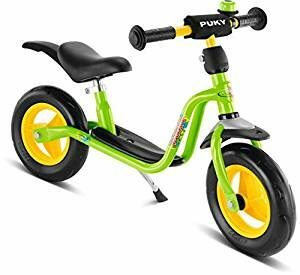 However, if you are shopping for your 2 year old and would like more options then don’t miss our guide to the best balance bikes for 2 year olds.